I love books, and I love reading, and anything that promotes children's literacy earns a gold star from me. So when the opportunity to go downtown to learn about a new campaign that promotes this very thing arose, I said yes. Yesterday at the National Press Room in Washington DC, We Give Books launched their new digital initiative that enables ANYONE with internet access to put books into the hands of children who need them, for free. But this campaign does more than give books, it helps you teach your child compassion. "Good parenting breeds charitable children," Dr. Marvin Berkowitz told us. Love and Support: Kids need to know that if it's important to them, it's important to you. Expectations: Set high expectations, give them a goal to work towards. Be the model: Practice what you preach, don't just TELL your children how to be charitable and compassionate, SHOW them. Talk to them: Engage them in conversations, teach them how their behavior affects others. Encourage and Empower their voice: Don't just listen, HEAR what your kids are saying. Encourage you child to be their own person. Give them the tools to succeed. Tell them what they're doing right, and how important they are. The exciting thing about the We Give Books initiative is that it makes it so easy to give! You can log in to the site at any time, 24 hours a day, 365 days a year, and give back. They even have the option to form book groups! This is a great tool for teachers, because it allows you to make a group for your class, and then you can set a goal, and work towards it. And how amazing would it be for your class to say, this year, we donated 500 books to Room to Read? You can even make the group private, so you don't have to worry about your kids while they're on the We Give Books site. To get your child involved in a campaign, visit www.wegivebooks.org, sign up for an account, and choose a campaign. Talk to your kids about the different programs available. Discuss the pros and cons of each one. Choose your favorite campaign, then read a book. For every book you read, another will be donated. The more your child reads, the more other children can read. The site is very simple to navigate. A list with photos of the book covers pulls up, they choose the book they want to read, and then just click to turn the pages. When they're finished, they start all over again. 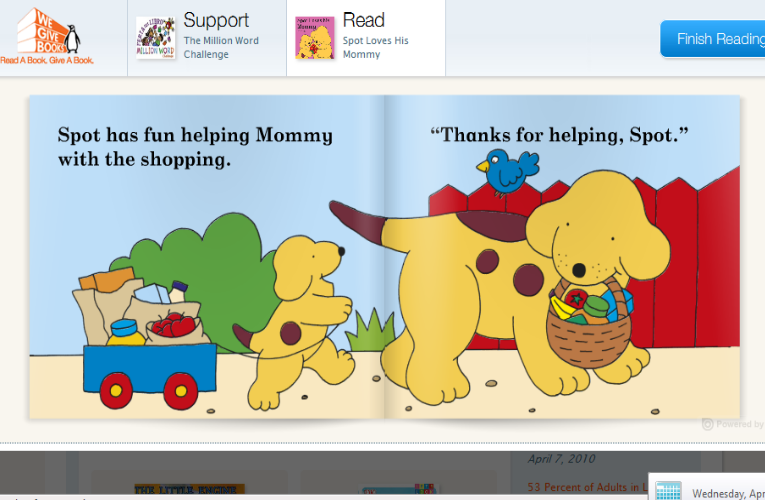 The site is geared towards children ages 0 - 10 years. Right now, the majority of the books available are for the younger crowd, but they are working to make more titles available. You can send feedback, and even suggest titles. Something else that's fun is that We Give Books has joined with Read for the Record! So on October 7, you'll be able to join in as we set a new world record for the greatest number of people reading the same book on the same day! This year's book is The Snowy Day, and it will be available online through We Give Books. I encourage all of you to head over to www.WeGiveBooks.org today. It's a simple concept, with a huge impact. P.S. 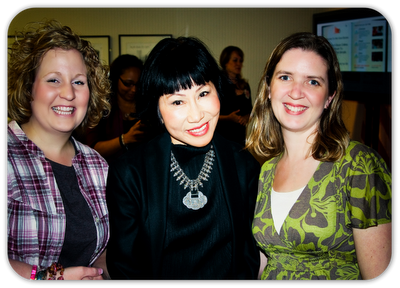 And I totally met Amy Tan. P.P.S. My hair should be blonder, no? P.P.P.S. I totally set up a group and YOU SHOULD JOIN. It's right here, MMBlogs. Disclaimer: I wrote this review as part of a campaign by Mom Central on behalf of www.wegivebooks.org. I received breakfast, a goodie bag, concert tickets to the Rock Bottom Remainders concert, and a gift certificate. And while all of those things are great, I would have done it just for the sake of doing it. Because it's that awesome. The end.